What should the objective be in SFI to be a top earner? What is THE plan for maximum success and income in SFI? As an Executive Affiliate, you'll automatically qualify to receive 10 new CSAs monthly and begin earning Co-Sponsor Commissions of 8% CV on all purchases they make...PLUS 1 Rewardical for every 25 each CSA earns! Additional perks of being an Executive Affiliate can include FREE TCredits, FREE group messaging, and much more! See Benefits Chart for details. As a Team Leader, you be qualified to start earning Team Overrides of 4% of ALL CVinfinitely deep in your group through Dynamic Compression. Additionally, you can earn unlimited Direct Commissions and Co-Sponsor Commissions! If you and your 3 PSAs are Builder Bundle subscribers (optional), you will also be adding 32 new affiliates to your team each month (384 new affiliates per year), each with the potential to further grow your income! Tip: Want to optimize your structure and maximize growth and income? Turn on Opti-Build™. TIP: Your Visual Genealogy makes it easy to identify your Designated Diamonds and future Team Leaders! Learn more. As a Team Leader, you can continue to build your Team Override commissions, earning 4% of ALL CV infinitely deep in your group through Dynamic Compression. Additionally, you have unlimited Direct Commissions and Co-Sponsor Commissions available to you to further increase your income. If you, your three PSAs, and the now 32 additional affiliates in your team are Builder Bundle subscribers (optional), you will also be adding 288 new affiliates to your team each month (3,456 new affiliates per year), each with the potential to further grow your income! If you, your 3 PSAs, and the now 288 additional affiliates in your team are Builder Bundle subscribers (optional), you will also be adding 2,336 new affiliates to your team each month (28,032 new affiliates per year), each with the potential to further grow your income! If you, your 3 PSAs, and the now 2,336 additional affiliates in your team are Builder Bundle subscribers, you will also be adding thousands of new affiliates to your team each month, each with the potential to further grow your income! If you, your PSAs, and even just a portion of the thousands of additional affiliates in your team are Builder Bundle subscribers (optional), your income has the potential to continue to skyrocket for the foreseeable future! Q: Do I have to buy products? No. All VersaPoints requirements can be met through sales to your customers and a variety of other actions (as listed on your To Do List). Any personal purchases are 100% optional and up to you. Q: How do I get the three people I need…and how do I get them to become PTLs? First, recruit as many people as you need to find at least three who are serious about building a successful business. For recruiting methods, click HERE. Next, use these strategies to help create activity and identify your future PTLs (at all times, remember to "work with the workers. )” Once identified, work closely with each of your three. Remember that if THEY succeed, then YOU will succeed. They are the key, so be there for them, focus on them like a laser! Keep working together, lead by example, and exercise dedication and persistence! Keep this up and soon your three will find themselves as EAs, BTLs, STLs, GTLs, and finally PTLs…making YOU a DTL. But make sure you focus ONLY on the next rank for them. If they’re only a BTL, focus only on them getting to STL! You will NOT develop three PTLs overnight or likely even in your first year or two, but just keep working the plan, working towards the goal, and you will get there! And on the way, enjoy the journey, because the journey is the real joy. 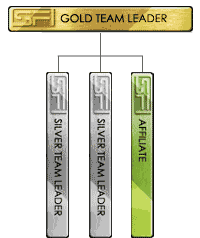 Q: Where can I see a comparison of the perks and compensation for each SFI rank all the way from Affiliate to Diamond Team Leader? Q: Does my structure have to look like the above diagrams? For example, to become a Silver Team Leader, do I have to have 3 Bronze Team Leaders on my first level? No. 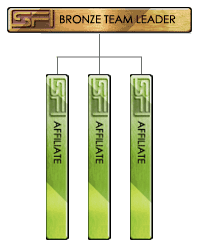 You can have as many affiliates on your first level as you want and they can be any combination of ranks. The above example diagrams are just to "show the math" of how you can advance through all the SFI ranks by developing EAs, then BTLs, then STLs, then GTLs, and finally PTLs. NOTE: To help you better visualize, manage, and build a 3-wide organization, just as The Plan recommends, check out your Visual Genealogy report HERE. Q: So I could have, say, 5 EAs, 1 BTL, 2 STLs, and 3 GTLs on my first level to meet the non sales/purchases VP requirement for being a Platinum Team Leader? Yes. The plan is very flexible. You can meet the VP requirement of any rank in any of hundreds of combinations. 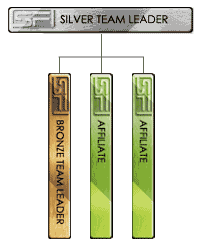 Q: If I'm not interested in doing the daily/weekly/monthly free actions, can I still advance through the steps and become a Bronze, Silver, Gold, Platinum, or Diamond Team Leader? Yes, absolutely. You'll just need to make up those points doing other actions (such as developing some more first level Team Leaders). 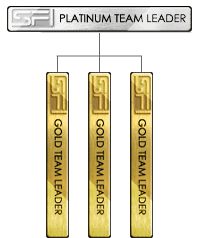 Q: Could I have, say, 20 or 25 Platinum Team Leaders on my first level? Yes, there's no limit, it's totally up to you how you structure your team. Q: If I attain the rank of DTL with three PTLs...and then one of them drops to GTL, will I still be a DTL? No. You must maintain a minimum of three PTLs to have the rank of DTL. Q: If I was formerly a DTL and lost this rank due to no longer having a minimum of three PTLs, what would my rank be then? Your rank would then be based on your VersaPoints. If you still had a minimum 6000 VP with the required minimums for VP from sales/purchases, you'd be ranked and paid as a PTL. Q: Could I be, say, a Silver Team Leader and have Diamond Team Leader on my first level? Sure, and you'll earn 600 VP for each personally-sponsored DTL, by the way! Q: So is the idea that once I reach the rank of DTL, I can retire? If you want to, yes, or maybe just semi-retirement (SFI's too much fun to totally retire from it, right?!). You'll just want to make sure that you have three solid PTLs on your first level. Q: What if I developed three DTLs on my first level? Would I get an even higher rank than DTL? 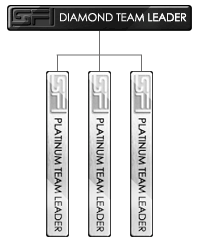 Diamond Team Leader is the highest rank in SFI at this time, but with three DTLs on your first level, you might very well be the highest earner in SFI! So that's a GREAT goal!